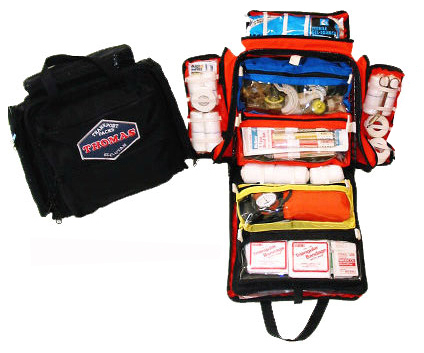 The Thomas Aeromed pack is an extremely space efficient and durable pack. The Aeromed Pack is specifically designed for initial care of the critically ill or injured patient. The Aeromed Pack is one of the best selling packs from Thomas EMS and has long been a favorite of helicopter medical teams. In addition, the Aeromed Pack is an excellent specialty kit for trauma, pediatric, neonatal, burn, obstertrical, cardiac or respiratory patients. The placement and closure of these pockets is specially designed to reduce the likelihood of equipment loss. The color coding and clear vinyl front pockets allow rapid location and access of equipment and supplies as well as quick re-stocking. The D rings on the back of the pack allow shoulder straps to be easily attached. The interior is lined with a removable padded aluminum stiffener which also serves as a splint when needed.